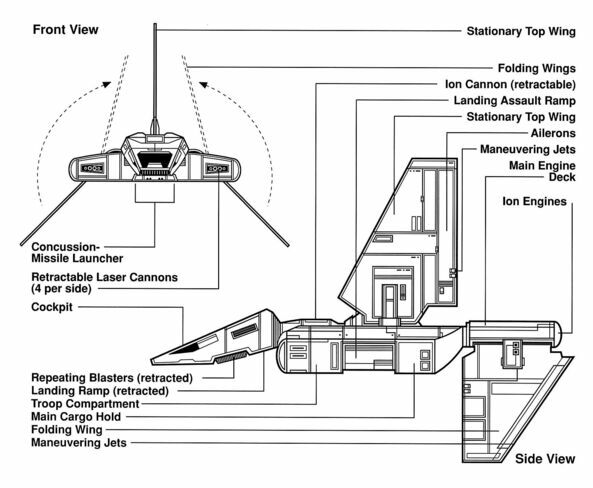 Sentinels are larger landing-craft versions of the Lambda shuttles (like the Emperor's in Jedi). They are outfitted to function as both landing craft and combat support craft. The Sentinel features heavier armor and more powerful armaments than the Lambda, necessitating a larger crew. Though one pilot can operate the craft, the standard crew is 2, plus 3 gunners. The Sentinel also features upgrades (as compared to the Lambda) to its sensor suite, autopilot, and communications gear. In its standard configuration, a Sentinel could carry 54 stormtroopers (approximately six squads), 12 E-web heavy repeating blasters, and 6 74-Z speeder bikes. When its seats were removed and it was converted to carrying supplies, it could transport 36 74-Z speeder bikes, or 12 compact assault vehicles such as AT-STs or AT-PTs. Its total cargo capacity was 180 metric tons. Sentinels were manufactured under contract by both Sienar Fleet Systems and by Cygnus Spaceworks. The Mu-class Model 2 shuttle is a fairly new design, a significant refinement of the older Mu-class Model 1. The updates included additional automation, reducing the crew requirement by 2. Additionally, the Mu Model 2's accommodations were much more comfortable than those on the earlier model, boasting larger enclosed sleeping cabins and a shipboard galley. The one drawback to the Model 2 as compared to the Model 1 is its reduced armament load; the Model 1 came outfitted with twice the weapons load. Outside of its military scouting role, Mu shuttles were primarily used to ferry passengers from large capital ships to planetside or to ferry small groups of people from planet to planet. As a result, many Mu shuttles were refitted slightly from their original specifications to more accurately match their intended role. For example, the sleeping galleys were stripped out and replaced with comfortable seating on some destined for regular ferry service. More details are available on Wookiepedia.